Enterprise Tracking – track desk to desk, but where the desks are in different offices. File and Document Tracking – track files and documents into storage, out of storage, allocate to members of staff / customers etc. Asset Tracking – Track all types of assets such as Furniture, Keys, IT Equipment around your infrastructure. Residential Tower Block Parcel Tracking – Book in items, email the tenant and get them to sign when they collect their items. Halls of Residence Parcel Tracking – Receive parcels and recorded mail for students, automatically email the student to ask them to collect and finally sign for their items on a signature pad. Mobile devices such as Tablets (Apple iPad, Android Tablets etc). It is scalable, so it can run on a single laptop computer for small installations right through to multiple server installations for global organisations. The system can be installed on a single laptop computer or desktop PC for small installations. 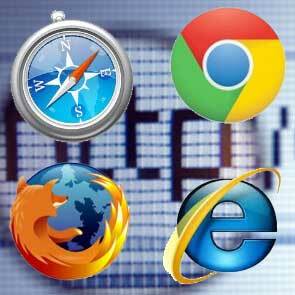 Most organisations will put it onto a single server, which is fine for most organisations. For global organisations wanting a single system to track items globally you may want to install on multiple servers and perhaps have some form of hardware redundancy designed into the architecture. The database the system uses is Microsoft SQL 2012 upwards. For most installations, the free SQL Express version is fine, but you can move to much higher performance editions for large organisations (such as Microsoft SQL 2008 Enterprise R2). The system is priced based upon the what you use and the relative number of users. That way it is affordable to all. Barcodes (or sometimes RFID tags) are produced for items that you wish to track. Mobile Computers are then used to track items through the various tracking stages that have been configured for you. Barcodes are used extensively both on items being tracked as well as on Mail Trolleys and Physical Locations. So for example a “Scan Into Storage” stage may ask the user to scan the location barcode (or select via a menu) and then scan the items they are putting into that location. Signatures can be captured by people signing on the screen. Photographs can be taken using the inbuilt camera to record / prove things such as failed delivery attempts (take picture of locked door or empty desk), damage or installation (take picture of item where it was installed). Data can be sent back to the website via Wireless LAN, Mobile Phone Network (3G, GPRS etc) or a simple desk cradle. 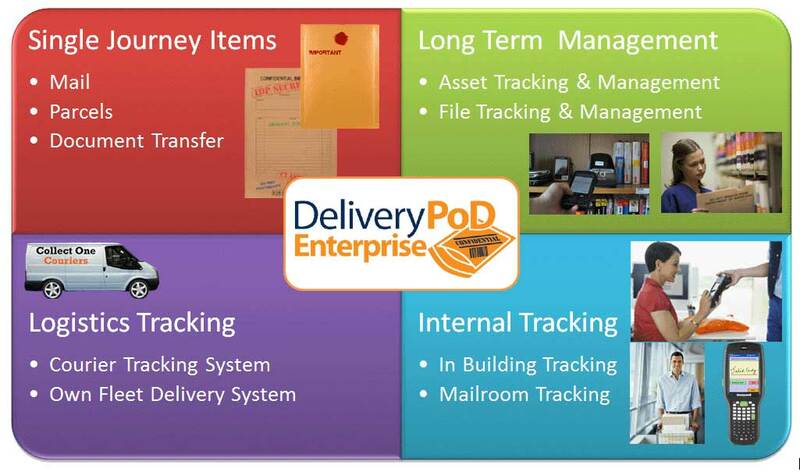 DeliveryPoD can track any type of item including mail, parcels, assets, documents and files. Single Journey Items – these are typically letters, parcels and documents that need to be tracked from Point A to Point B at which point they are deemed to be delivered and tracking stops. Our dedicated Mail Tracking and Parcel Tracking modules provide the perfect answer for these types of items. Specialist features are geared up to the single journey, no matter whether it is going from a mailroom to a person at a desk or from a desk in one office to a desk in another country. Long Term Items – these are likely to be Assets, Files and Documents that you keep for many years and need to keep track of. These type of items are catered for with our Asset Tracking and File Tracking modules which have features dedicated to both tracking and managing these types of items. Unlike mail and parcels you need to record things such as Category, Owner, Planned Retirement, Retired, Value, Depreciation etc. You also need to carry out things such as Location audits to make sure what you think is in a physical location is actually still there. Organisations are free to purchase the modules they need and not the ones they do not. If you only need Internal Mail Tracking, you can just purchase that module. If you just need Asset Tracking or File Tracking you just purchase the module. Whilst DeliveryPoD allows you to separate out long term items (Assets, Documents and Files) from single journey items (mail and parcels) you can actually track all types of items with the same mobile computer at the same prompt! So for example a member of staff can deliver Mail, Parcels and Assets at the same time. We call it the “Seamless Integration” of tracking systems. Another way of looking at it is that you have a seamless tracking system for mail, parcels, assets, documents and files. Some customers have configured tracking stages for proving that a process has been complete, rather than just for what we would view as normal tracking. For example one customer has a “Assessment Complete” stage where they scan an item returned for repair once the person assessing whether it is economical to repair has completed the task.